First Sentence: The practice of law is best performed by lunatics. Reason for Reading: I was selected to preview this book through Harper Collins First Look Program. It sounded like it would be a fun mystery to read. 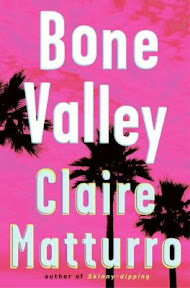 Comments: Bone Valley is the third in Claire Matturro’s witty and fun-slinging mystery series. I have not had the opportunity yet to read the two previous books, but Bone Valley was a great introduction to a series that is bound to bring out lots of laughs. Lilly Cleary is not only a trial attorney who longs for a big malpractice case, she’s also obsessive compulsive when it comes to cleanliness and the food she eats. Lilly is the type of character who lands herself in difficult situations frequently, and in Bone Valley, there are plenty of those. She’s got a great deal of company amidst a cast of colorful characters, including her elderly neighbor who “stole” Lilly’s dog, the alcoholic poetry-loving handyman, her maybe fiancé Philip, her hippie brother Devlon, and her motherly secretary Bonita, just to name a few. There is also one of my favorite characters, Lenora, who takes in animals and birds of all sorts and nurses them back to health. In Bone Valley, Lilly gets more than she bargained for when she agrees to defend two environmentalists, Angus and Miguel, in a libel suit. The two men are accused of defaming oranges, Florida’s main money crop. The situation grows complicated when one of her clients is blown up as she looks on. The stakes are suddenly higher and Lilly is not the kind of woman to back down from getting to the truth. Bone Valley is a laugh out loud novel that was impossible to put down. The main character, Lily, is witty and charming, even with her quirks and penchant for getting to the truth no matter what. Claire Matturro takes on some serious environmental issues, softening them with humor. I will definitely be seeking out other books by this author. Favorite Part: Carrots certainly are good for more than just one thing. Miscellaneous: My husband had to undergo a root canal recently and seems to be recovering well from that. It brought back memories of my own root canal last year. Not an experience either one of us hopes to have often. This past week, we went to the theater to see The Departed starring several big name actors. Both my husband and I really enjoyed the move. On DVD this weekend, we watched Thank You for Smoking and Lucky Number Slevin.